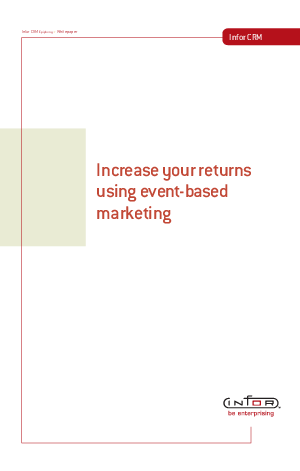 Event-based marketing is the identification, definition and execution of campaigns based on events that affect a customer relationship. It's an approach to business-to-business and business-to-consumer marketing that addresses the appropriate timeliness of offers from the customer's perspective, rather than the company's perspective. Both individually oriented events, such as a customer depositing a large amount to a savings account, having a series of dropped cell phone calls in a short period of time, or abandoning a shopping cart, as well as non-individually oriented events, such as a network outage, a snow storm in Vermont, or a sports team winning a game, are now able to be identified in Outbound Marketing and associated with campaigns. These campaigns can then be executed immediately (or after an appropriate delay) when triggered by an outside event. No time delay due to loading the data mart is necessary, thereby ensuring that the campaign reaches its recipients at the most relevant moment. Read this paper to learn how Event-triggered marketing has seen five times the response rate of non-timed mass-marketing campaigns and how your company can take advantage of event-based marketing by using Infor CRM Epiphany Outbound Marketing suite.